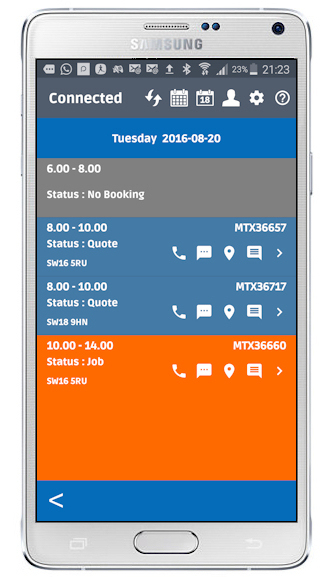 A simple and elegant layout for displaying the field appointments in the app. Colour coded so you can easily see whether it's a job or a quote, orange for a job, blue for a quote and the size of the block gives you an idea of how long they will take - just like the system. From here it's easy to communicate with your customers while you are in the field. Press one button to call them and another to send a text message. Press the 'en-route' button to send an sms text message to the customer with your exact location and estimated time of arrival - just like Uber! It means you have a simple, easy to use schedule that tells you just which appointments you have in the day, how long they last for and where they are - and it has a nice built in navigation feature so you can get guided straight to the door. Can't get a connection? Don't panic. Flobot stores the information on your phone so you will be able to use the app even if you can't get a 3G or 4G signal. And when you do get one, it will sync with the server automatically and get any new data that you should have received or send any information back to the office.